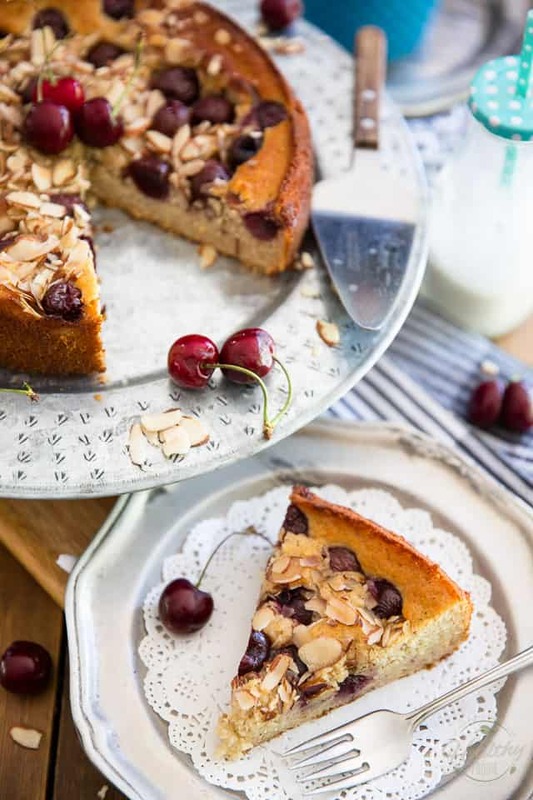 Completely free of guilt, gluten or refined sugar, this Cherry Almond Cake is so unbelievably delicious, it’ll have everyone fooled, even you! It had been an awful long while since I’d last come up with a dessert recipe on here. The thing is ever since My Evil Twin had been granted access to my kitchen, she’d pretty much taken full control of the “sweets” department. However, I recently came to the realization that giving free rein of the kitchen to my evil side was really detrimental to my health, even if it was only once a week, so I decided to give the wicked sister the boot and to stop posting so regularly on my other, indulgent blog. Still, the baker in me was not about to go down without a fight and soon demanded some air time. 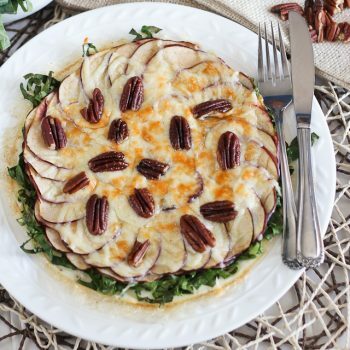 So yeah, it didn’t take long at all before I came up with a guilt free dessert recipe! And you know what? 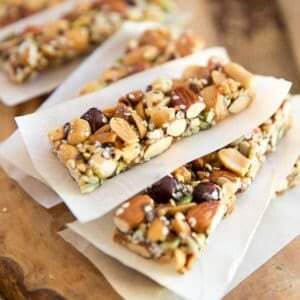 I now realize that I’d forgotten just how honestly good healthier treats can be! 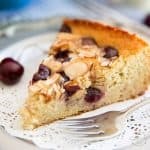 I’m telling you, despite being completely free of guilt, gluten or refined sugar, this Cherry Almond Cake is so unbelievably delicious, it’ll have everyone completely fooled, including you! Everything about this cake is absolutely perfect, if you ask me. 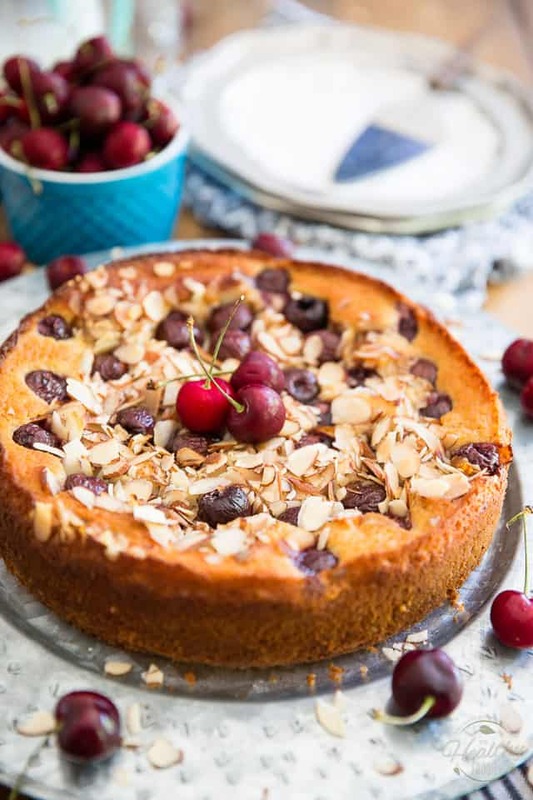 From the moist, tender but slightly dense and chewy texture of the cake to the scrumptiously crunchy and fragrant contribution of the almonds and the juicy cherry explosion that hits your palate with every bite, this simple yet elegant cake brings the perfect conclusion to any summer fare. I can guarantee you this: don’t say a word about the “healthy thing” and no one’s gonna be the wiser. I really missed baking healthier treats, and I can’t just wait to come up with more. Grease a 9″ springform pan and line the bottom with parchment paper; Preheat your oven to 350°F. 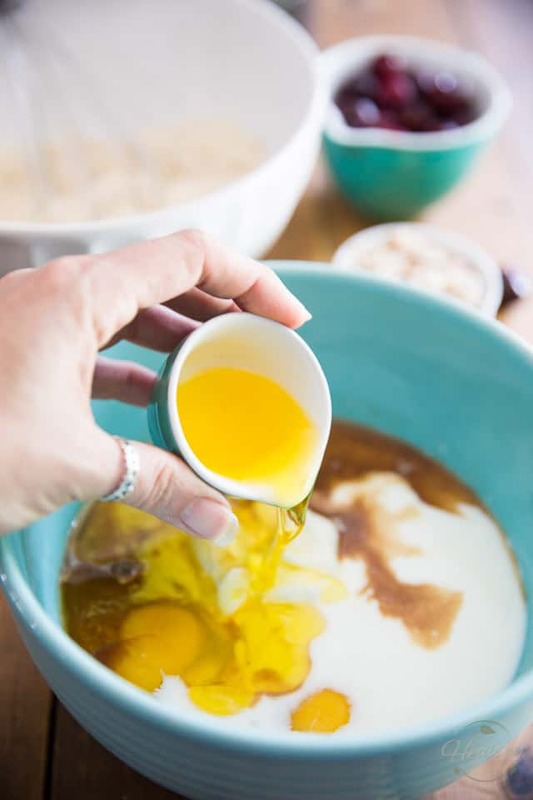 Combine the Greek yogurt, buttermilk, honey, eggs, vanilla and almond extract in a mixing bowl. Then, pour in melted the ghee (or coconut oil, if you’d rather use that) and start whisking it in promptly to avoid clumping. 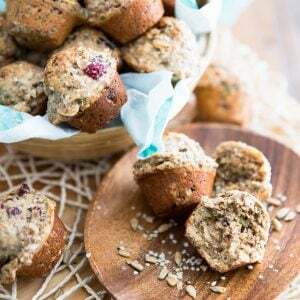 Since the other ingredients are cold, if you were to let your fat sit together with them in the bowl for too long, it would start to solidify and clump up practically on contact. So really, be sure to add that melted fat last and start whisking as soon as you add it in. Continue whisking the wet ingredients until they are all fully combined and set that bowl aside. 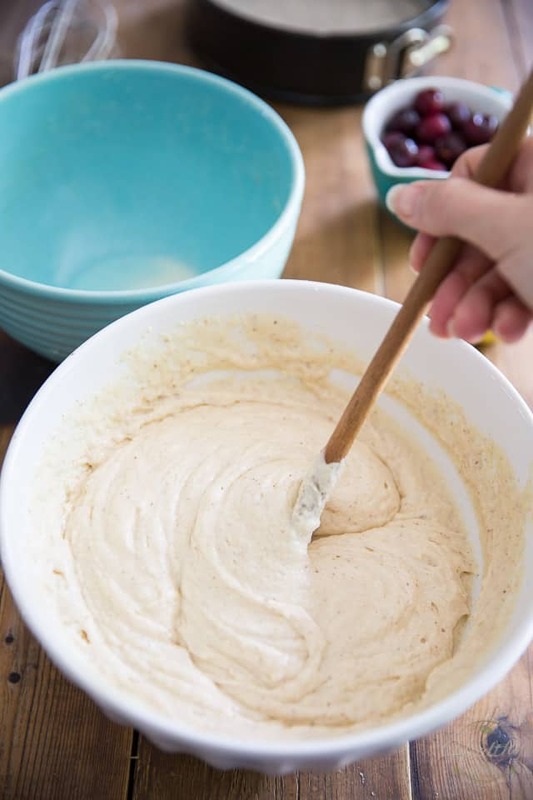 Next, combine the dry ingredients together in a separate bowl and mix them delicately with a whisk until they are fully combined and airy. Stir promptly with a wooden spoon or rubber spatula until fully incorporated. 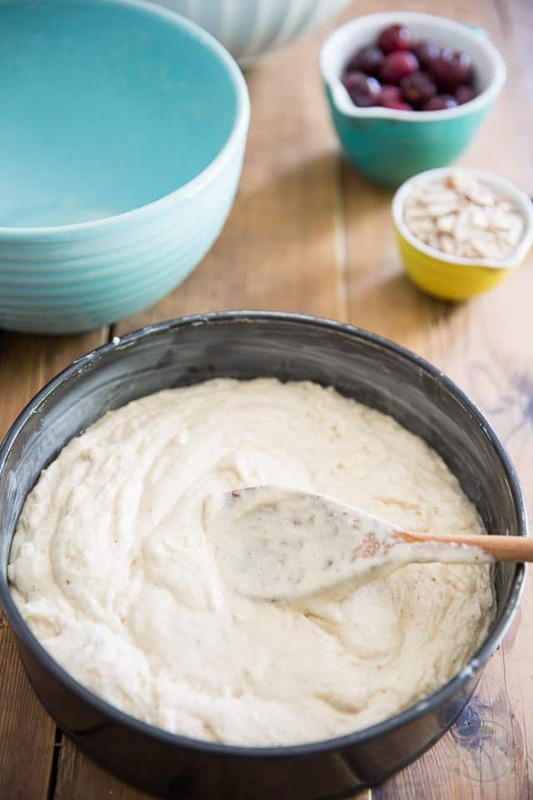 Transfer the cake batter to the prepared pan and spread it evenly all the way to the edge. 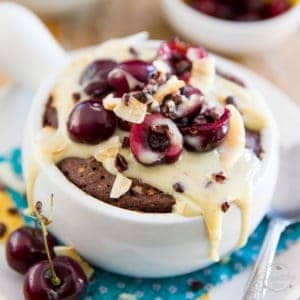 Top with the fresh cherries, pressing them delicately into the batter as you go, then sprinkle with the sliced almonds. 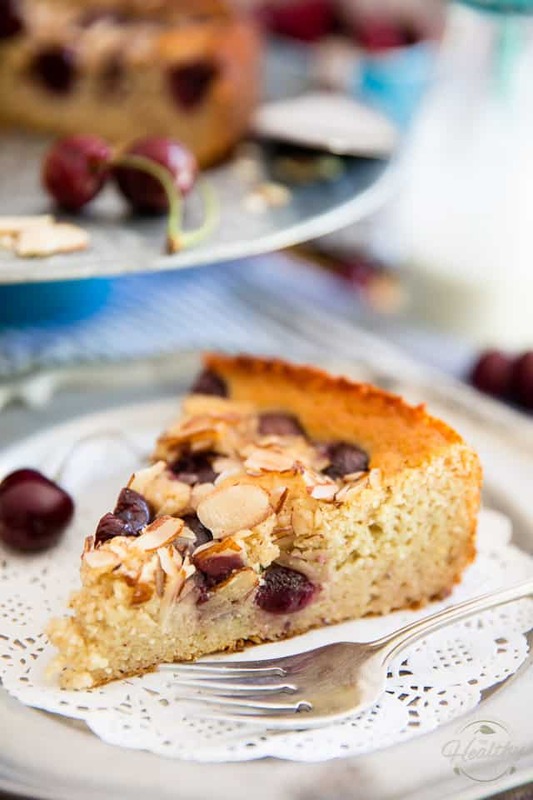 Place your cake in the preheated oven and bake it for 35 to 40 minutes, or until a toothpick inserted in the center of the cake comes out clean. 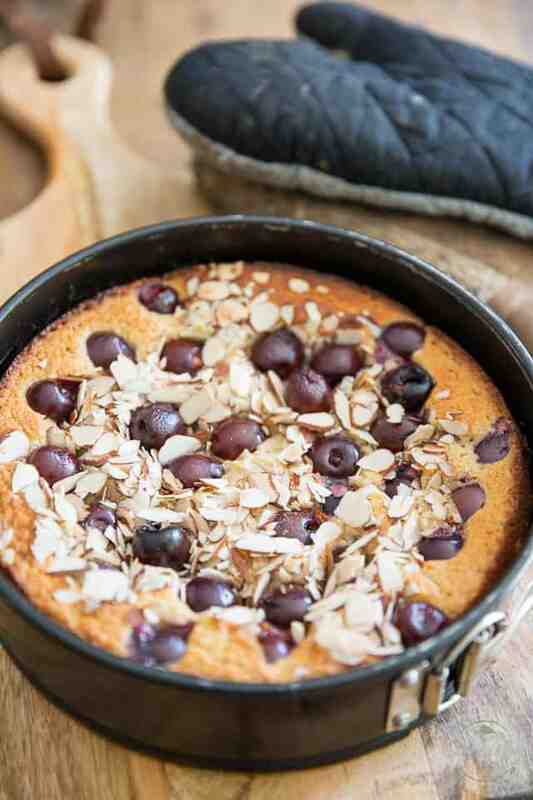 Take the cake out of the oven and allow it to cool completely to room temperature before taking it out of the pan. You can then slice slice and serve it immediately, or place it in the fridge and serve it completely chilled. 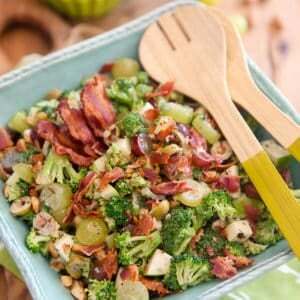 Any leftovers will keep well in the refrigerator for up to a week. 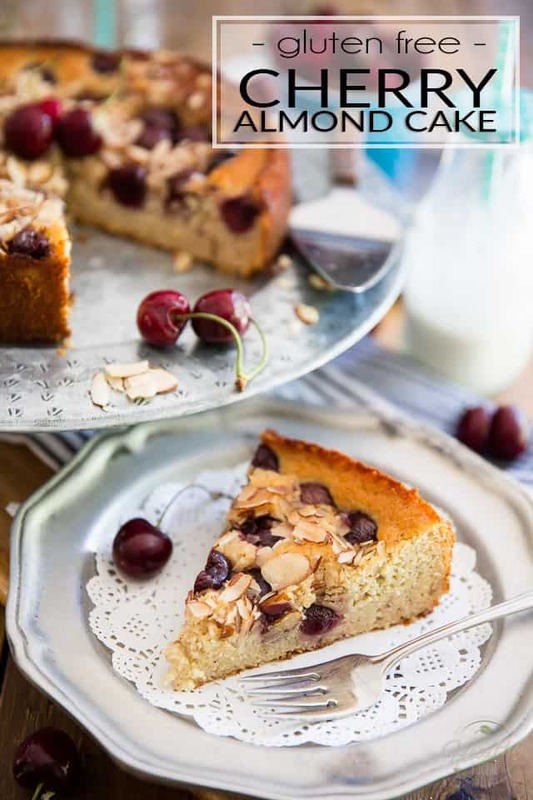 Completely free of guilt, gluten or refined sugar, this Cherry Almond Cake is so unbelievably delicious, it'll have everyone fooled, even you! Grease a 9" springform pan and line the bottom with parchment paper; Preheat your oven to 350°F. 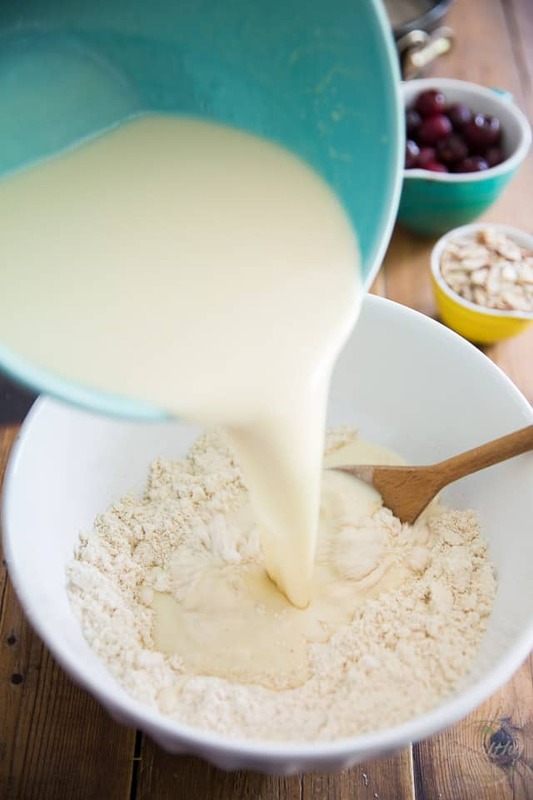 Combine the Greek yogurt, buttermilk, honey, eggs, vanilla and almond extract in a mixing bowl. Pour in melted ghee (or coconut oil) and start whisking it in promptly to avoid clumping. Continue whisking until all the ingredients are fully combined and set aside. 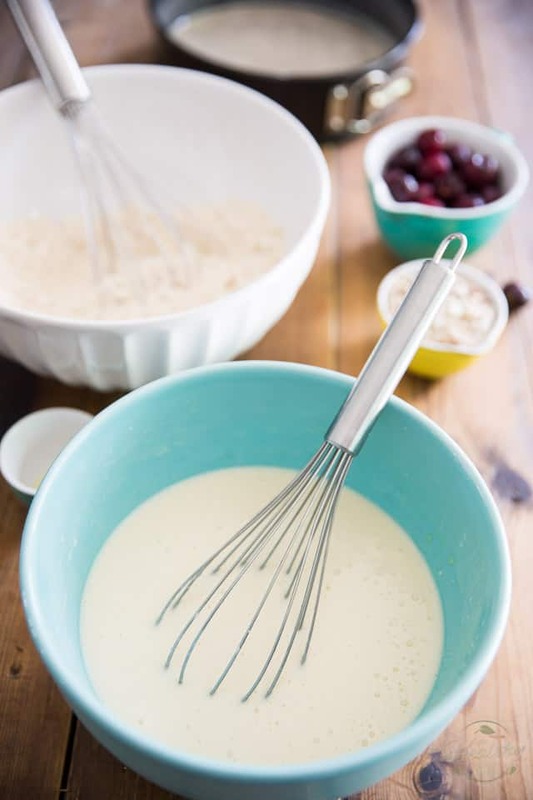 Combine the dry ingredients together in a separate bowl and mix delicately with a whisk until fully combined and airy. Pour the wet ingredients all at once over the dry ingredients and stir until fully incorporated. Transfer the batter to the prepared pan, spread evenly all the way to the edge. 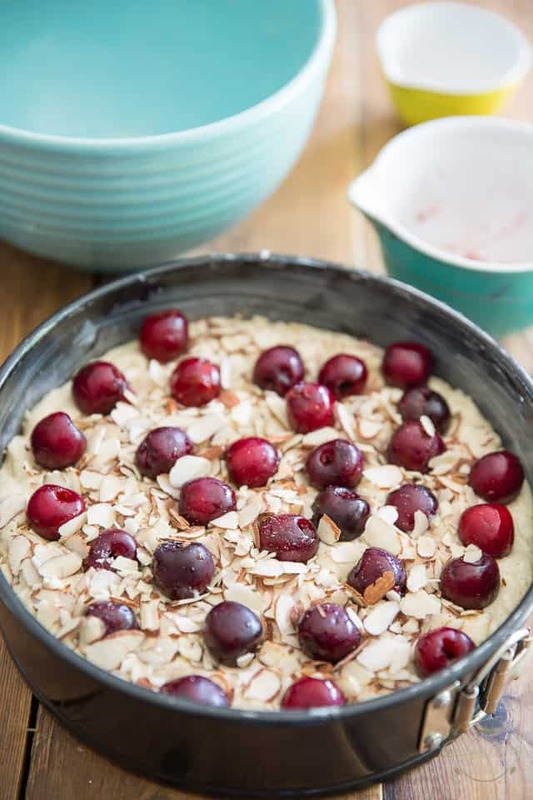 Top with fresh cherries, pressing them delicately into the batter, then sprinkle with the sliced almonds. Bake in the preheated oven for 35 to 40 minutes, or until a toothpick inserted in the center of the cake comes out clean. Allow cake to cool completely to room temperature before to take it out of the pan; then slice and serve. Keep any leftovers in the refrigerator for up to a week. Oh my, what a delicious looking cake. I need to try this for the GF folks. Wish I could make it DF too. Have one DF,GF person in the family. Is it ok to use maple syrup in place of the honey? I really don’t see it as being a problem, Jennifer! Oops.. ‘too’ not ‘to’.. didn’t proofread my writing. Made this for a morning tea using fresh cherries. It was very nice, moist and not super sweet. 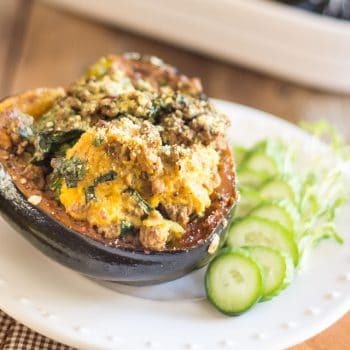 Was such a hit with everyone that they all took a piece home with them and I’ve had to send through the link for the recipe! 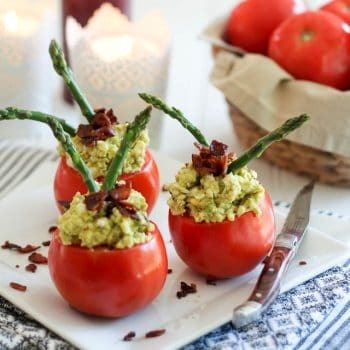 Fresh Stuffed Tomatoes – or the day California Tomato Farmers saved the day! 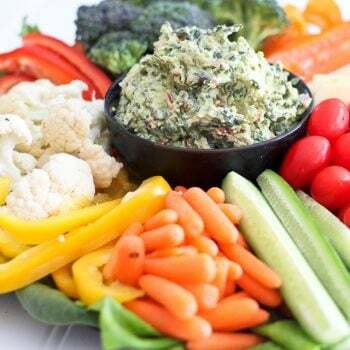 Avocado Spinach Dip – So good, you’ll want to eat it by the spoonful!